I’m a huge lover of neutral eyeshadows, in fact they’re the only colours I’ll use. There’s nothing more I love than a natural brown smokey eye for a night out, I much prefer to use a colourful lipstick than a colourful eyeshadow. So when Chemist Direct contacted me and asked if I wanted to try out the Bare Minerals Ready The Truth Eyeshadow Quad, I was really excited to try out some gorgeous neutral eyeshadows from one of my favourite brands. 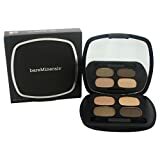 Bare Minerals Ready The Truth Eyeshadow Quad is made up of four eyeshadows, ranging from a really light shade, to a dark shade, and everything in between, giving you everything you need to create the perfect smokey eye. The lightest shade hardly shows up against my skin tone but makes a great highlighter shade, and the other three work perfectly, although the darkest shade is probably a little too dark for my personal taste. What I like about this eyeshadow quad is that even though all the eyeshadows are in powder form, they feel and apply just like they’re a cream formula. And because of this they last for hours, even without using a primer. I absolutely love this eyeshadow quad, it’s made up of all the neutral colours you’d need, and is the perfect handy size to take with you if you go away, rather than being big and bulky like some eyeshadow palettes. I really love Bare Minerals products, and this is certainly no exception! I think I’ll be using this eyeshadow quad for a long time to come.